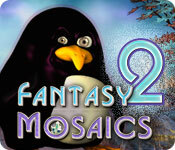 Fantasy Mosaics 2 is rated 4.1 out of 5 by 14. Rated 5 out of 5 by spiritlaughing from As Much Fun As The First Fantasy Mosaic As usual, starts off simple, then gets progressively difficult. There are sometimes hints to help you out. The colors are bright and vibrant and fun. Only one color is used per puzzle. 20 sets of 5 puzzles each, so 100 puzzles to solve! Helps you exercise your brain in deduction, math, and good old common sense. I love this game! Rated 5 out of 5 by canadiangirl94 from Excellent Addition They don't waste any time getting straight into some challenging problems. It was good not having the start super easy since the first Fantasy Mosaics provided that. 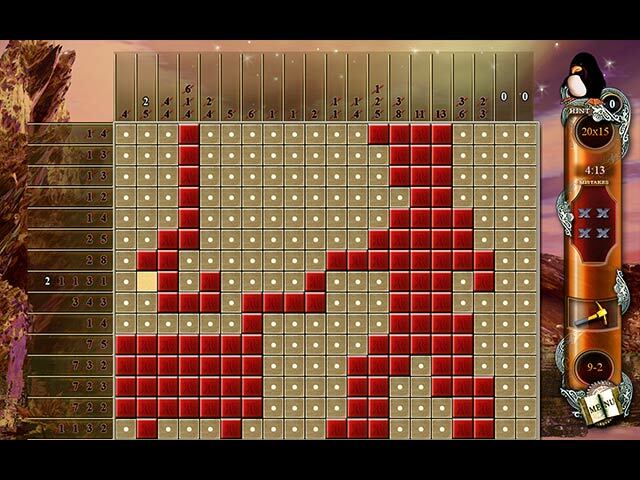 Enjoy the pieces of your zen garden you get after completing the different sets of 5 puzzles. Nice soothing music helps you relax and make it easier to focus on the puzzle and not get overwhelmed by it. Rated 5 out of 5 by heleneshaw from Best one yet! I love mosaic tile games... I really enjoyed the first fantasy mosaic, and I liked this one even more... Great pics! Love the features, like how it automatically fills in the row/column with the "negative tiles" once you've uncovered the "positive" ones. And the hints make sense! The only thing I might like to see that isn't there is the ability to right click and drag... but it's no biggy! Keep them coming... These are my favorite mosaic tile games yet! Rated 5 out of 5 by mrm2006 from Surprise! I LOVE this game! I have always had the most trouble in the world trying to play games like this. But, the Fantasy Mosaic series really taught me the basic mechanics of the game. The background music is so soothing you don't even know it's there after a while. Strategy when placing your pieces on the tile and a lot of patience is needed. You do get bonuses in terms of hints and a hammer that fills up and you can use it to check if a single tile gets a "move" or is "empty". I never in a million years thought I would enjoy this type of game. I have no patience and am not really a strategic person but this series of games did a great job teaching me how to play and I hope everyone will take advantage of the free hour and try it. Happy Gaming! Rated 5 out of 5 by bjcs319 from Love these games Was hoping for this one. Glad BF got it. I love these kind of games. Hopefully there wil be more of these coming. Rated 5 out of 5 by jil1 from Excellent... Fantastic again... I was wandering when we would receive a new gift like the first Fantasy Mosaic... and there you are. Simply wonderful. 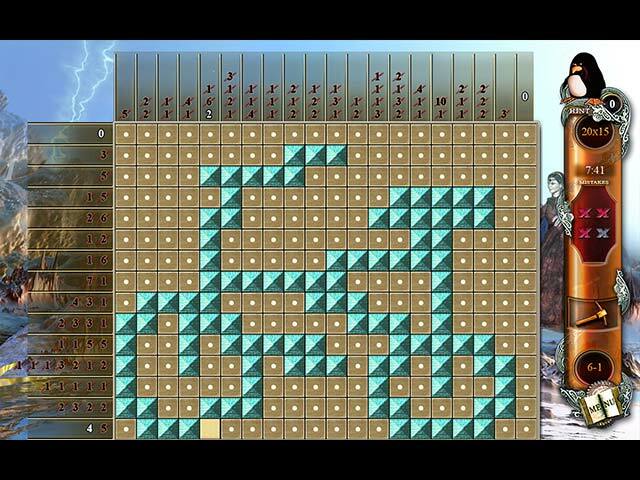 For those that like this kind of puzzle game they are the best. I bought all of them and don´t stop playing. I love mosaics. Surely I recommend this one. Rated 5 out of 5 by pennmom36 from More Challenging Puzzles Well they don't give you much time to ease into a groove, the challenges start right from the start in this second edition of Fantasy Mosaics. The object of this game is to logically fill in cells on a grid with number clues, keeping in mind that there must be a space between numbered cells. Every step you take in the game will help culture and restore your fantacy garden, but personally I could care less about building a garden. There are 20 chapters with 5 levels each and the goal is to earn a gold trophy. There is a tutorial at the beginning but only as an illustration, not a guided step by step process, if you haven't played this type of game before hang in there once you get the hang of it you're hooked! Some of the cells contain bonuses such as an axe which will allow you to reveal the state of a single tile, a keg? which allows you a chance to make an extra mistake, and a penguin which will give you a hint by highlighting a single filled tile. Another winner, enjoy! Rated 4 out of 5 by J4016C from Good strategy game I always have liked mosaic games. This one has good clear graphics which has been missing from other mosaic games. I like the challenge of this game. The only thing I do not like....music cannot be completely shut off and it is so annoying! Rated 4 out of 5 by Cabbagepatcher from Addictive This game is better than World Mosaics, but I do miss the WM storylines a bit. (I still laugh at the one where the guy gets barfed up by the dinosaur) Fantasy Mosaics doesn't waste time starting off with simple puzzles designed for people with water on the brain, but cuts right to the chase and get you thinking. I love how it automatically fills up the line with blanks when there are no more squares to select, and it tells you when you have filled in a group of squares correctly even if it's in the middle of a line. It makes solving the puzzles more of a logical progression rather than just guessing and hoping. Bit of a downside for me - the mouse selections are too hairtrigger and I often find myself selecting or rejecting squares that I had no intention of clicking on. This can often result in too many errors and shutting down the individual game so that I have to start again. Music IS boring but not as dreadful as some of the WM tunes. Rated 4 out of 5 by LogieBaby from a nice entry for the genre There have been quite a few mosaic style games in the past few weeks. Most have been mediocre IMO. Fantasy 2 is a step above its most recent predecessors. Not much of a storyline and the theme is Oriental in nature. The background music is pleasant; however it would be nice if developers varied the score to avoid boredom. 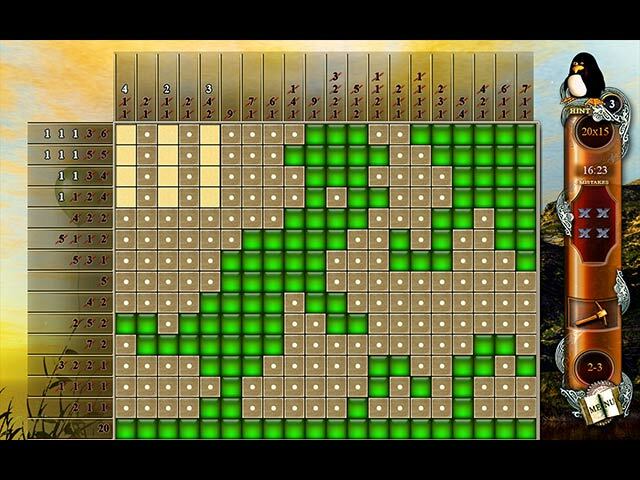 The nicest part of Fantasy 2 is the lack of super easy grids to begin the game. I am pleased this developer elected to not do a lot of hand holding at the initial phase of the game. In fact there are some challenging grids from the outset. Another fine feature is the grid variation from the getgo. So many grid games start with a bunch of 10 X 10's which get boring really fast. This one intersperses 10 X 10's with 15 X 15's and 15 X 20's early on. I also like that once a vertical or horizontal line is filled with cubes, the remainder of that line is automatically filled with blank spaces. It has been quite some time since I purchased one of the World Mosaics, for so long a time that group has been the standard of the genre. This game will more than likely be added to my repertoire by using a free game credit. Thanks dev for a nice game.